what, no comments? This is an amazing shot of an amazing, gimlet-eyed gamine! Beautiful shot and she’s so stylish! I love her hair style!!! She’s just doing everything right, isn’t she? Beautiful, classic tones of brown. Great photo, you really have the eye for capturing the perfect light! I love the drama of the fur on the coat. makes me miss my 2 weeks in Ireland already. hoping for colder weather in Los Angeles! Great picture, love the coat and the fur on it! She’s so pretty, love the pixie cut. Don’t like her haircut (in my opinion, it’s too harsh for her face) but I LOVE the fur collar framing her face! On the contrary! The short, unpretentious hair makes her rascal sweetness shine even brighter. OOOh sooo niceeee, I love the picture! Love it! I wonder what time of day this– the light just barely hitting her (and the tufts of fur) is what really makes this a stunning portrait. Love her hair. Eyebrows! Fur. Light! I like pics from the streets. Great light. 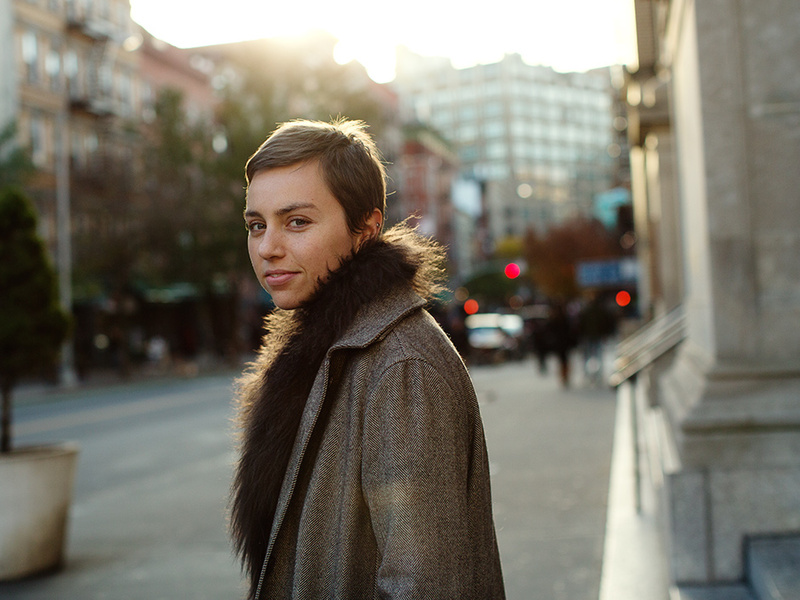 I love short hair on a beautiful face and a feminine outfit (I love furry collars!). She’s beyond gorgeous. I love her hair. I think it matches her face perfectly! Bleeker Street… so looking Forward to my next walk there. Amazing portrait! I love the light and the background, she looks beautiful! The picture is very beautiful, she is special, her look is clean and timeless. I love a little fur flair now and then, like the on she is wearing. Thanks for this, it’s beautiful. great haircut and great coat! great picture too! Love the coat. This lovely lady always looks amazing and does great things with tonal color. Awesome shot, love the look. She would look stunning with silver hair. Can you imagine that, see that? Perfect time of the day for some photography. Love the fur. I wonder if it’s real? Yes, nice. A little faux fur always adds style. Amazing attitude here! And great hair. …eventually everyone who watches this blog will be convinced to cut their hair short, i think. Love the beautiful rich brown fur trim on her coat. Plus, her haircut frames her face amazingly! Stunning photo, she looks a lovely girl. Love everything about her! Amazing light, and the face is simply beautiful. Just love the haircut. She looks amazing. And this picture is the prove that you can get a quite feminin and timeless look with short hair.